Good luck boys. In to see the haul. Doug promised me some tuna! Well...maybe not. But I think he did. Ill be home tomorrow, come get ya some! Good to meet you today glen and Doug, I’ll try and talk myself into the next trip out. Pics don’t do the size of those fish justice, many of those yellowfin were absolute donks. 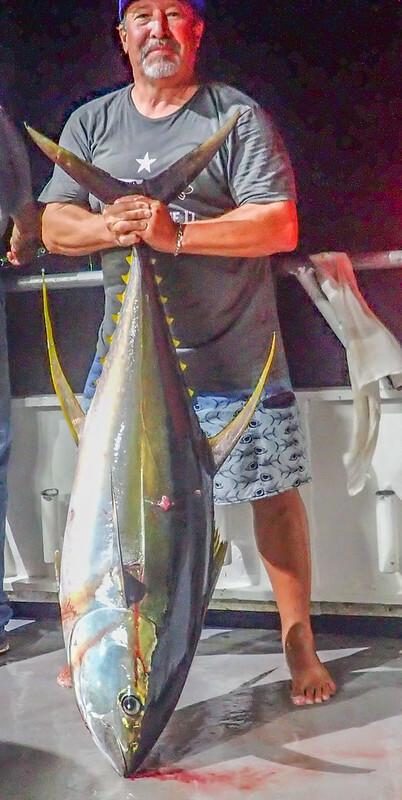 Big tuna was 143 lbs. Average weight was 90 lbs. 3600 lbs cleaned at the fish shack not counting those that took their own to clean. 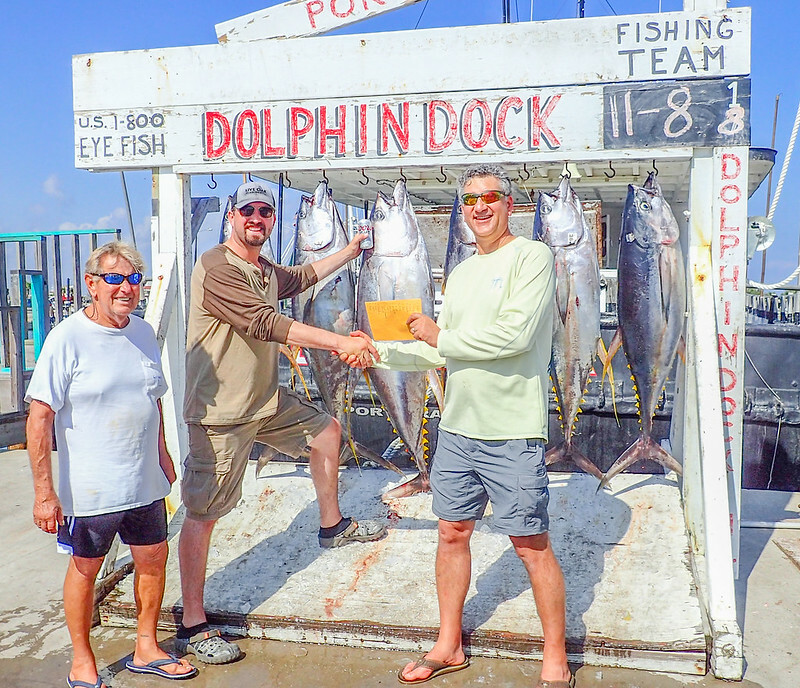 Yellow fin loss at the rail was apx. 1500 lbs. Deck , rails, benches covered in blood both nights. Tails thumping the deck all night both nights. It got tragic and stayed tragic the entire trip as always. Very bad 2 nights to be a tuna fish. It was great time with old friends and guys I just met. Well done gentlemen, congrats to all. I wish Syl and I would have been down there to welcome that load back to dock. Stickman. Great to meet you as well. Guys that keep saying they gotta do this. I highly reccomend it. It may be a one time deal or just the opposite. You may go for a one time trip and end up being a regular. It is an awesome experience. Until you are able to witness these fish feeding on top you will not understand the spectacle. WOO TO THE DURN HOO!!!!!!! I'm at work and barely had time to get my fish organized in 3 boxes last night. Never had to go to a third box before. Big chunks of prime tuna loin. Poke will be made tonight as I dive in and start processing. Plan to smoke and can tuna this go round. Will steak the primo cuts, can the trimmings and slot some to the side for tuna jerky. Dock said I had 328 lbs of fish?!?!?!? Had about the same fishing Baja Mexico last month. Between here and there. Did it in 50 hours here....there, did it in 4 days. 700lbs of fish in roughly a month...guess that's it for awhile? 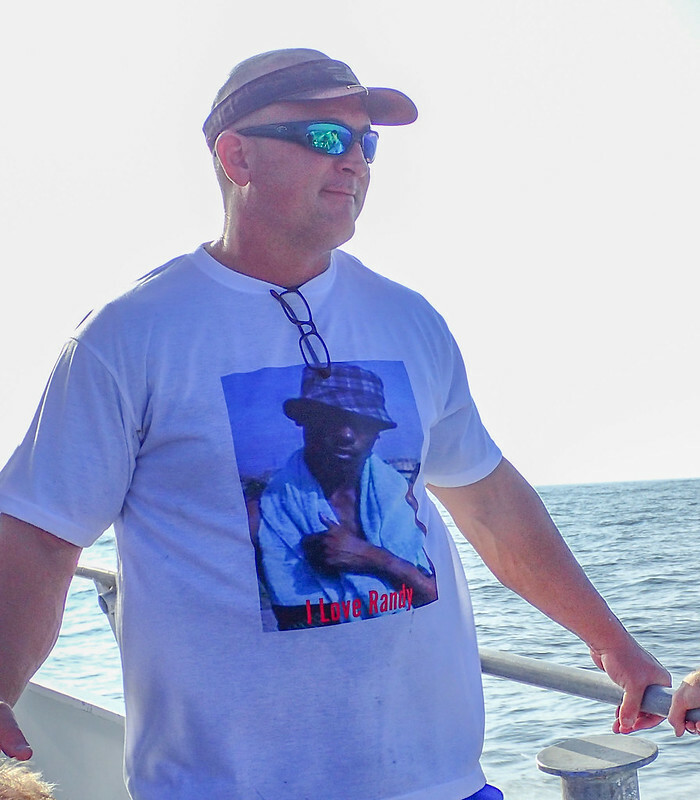 I absolutely enjoyed fishing with my old Middle Coast Compadres and finally meeting some NewUn's too!!!!! 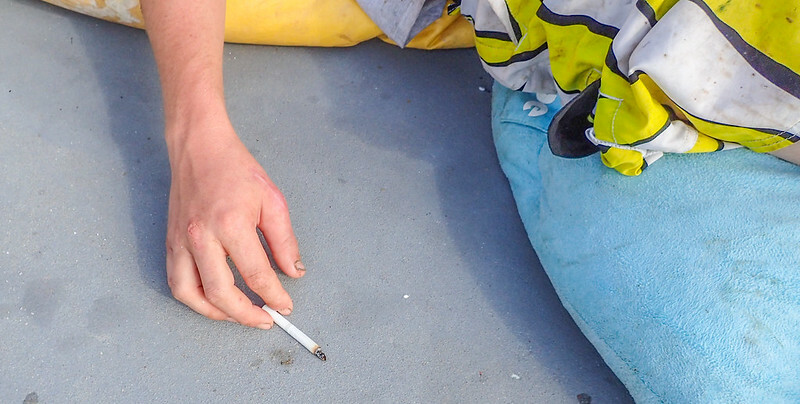 Glad to see you Stickman - looked for you after I got my junk off the boat to chat, will catch up soon enough. Got side tracked with talking to Tim in the Office about the Mexico Trip with Timmy and Halco. I had a solid fish that made the vertical rack, over 100. Never weighed it......should of. 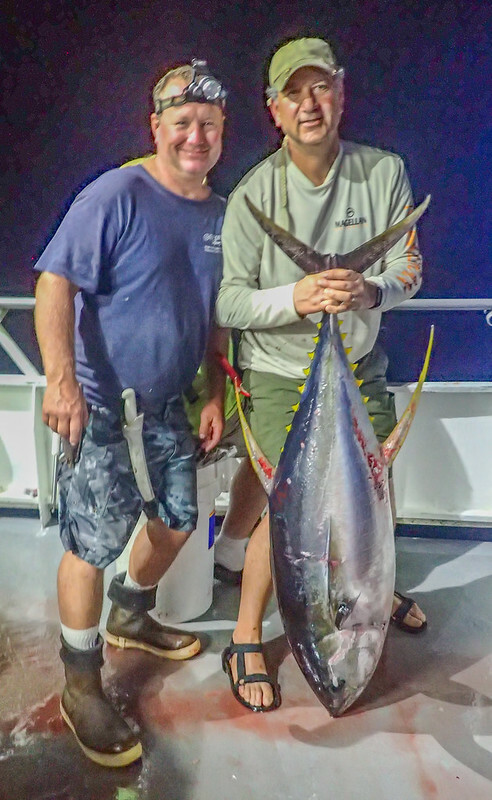 The Almaco Jack went 32lbs. 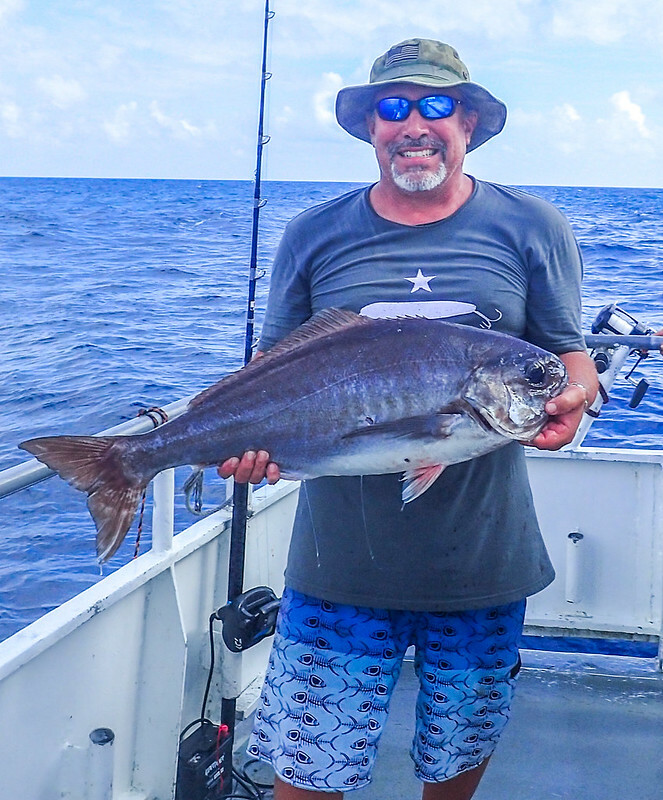 Barrelfish were in the 20s. 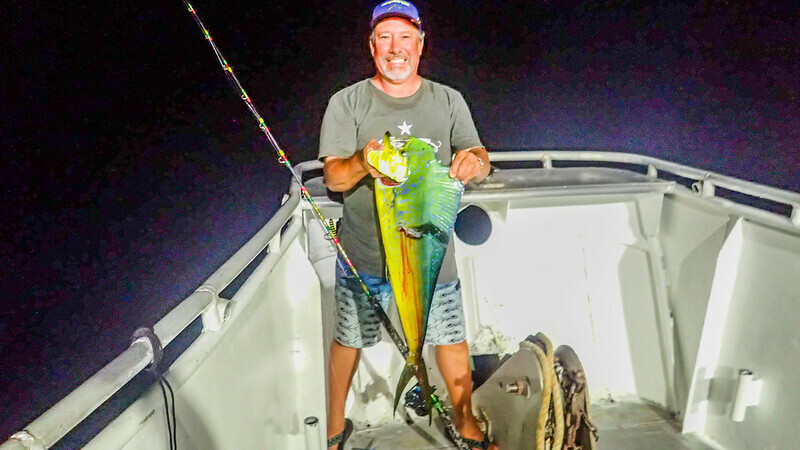 Mahi was in the teens. Grouper were around 7lbs. Nice solid mix of filets. Last edited by AtTheWall; 11-09-2018 at 02:54 PM. Can we simply say REDNECK - SON!!!! Glen and Doug went fish processing across the Marina. Awesome guys! 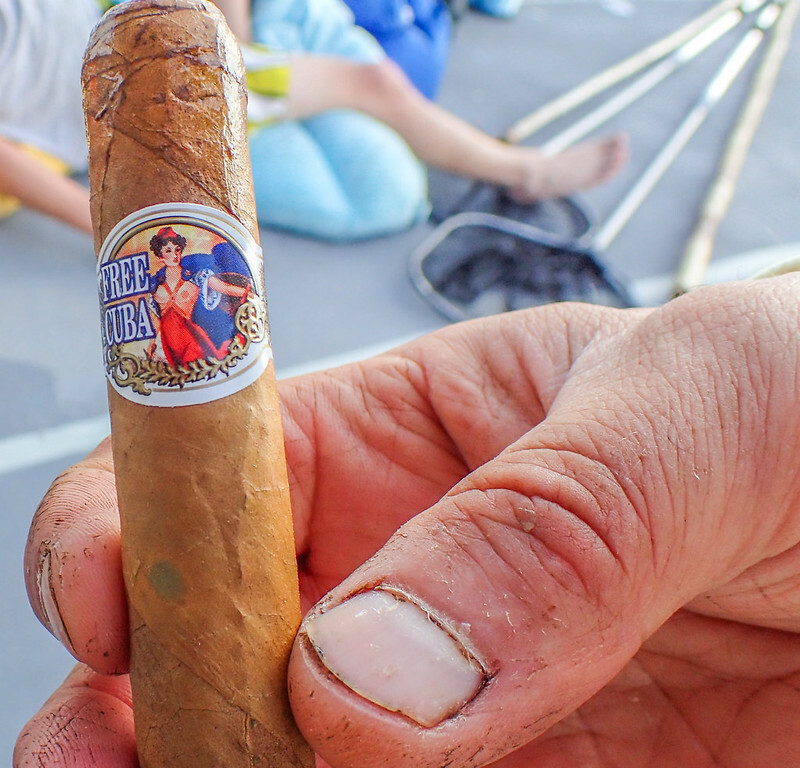 Congrats on yet another epic offshore fishing adventure. 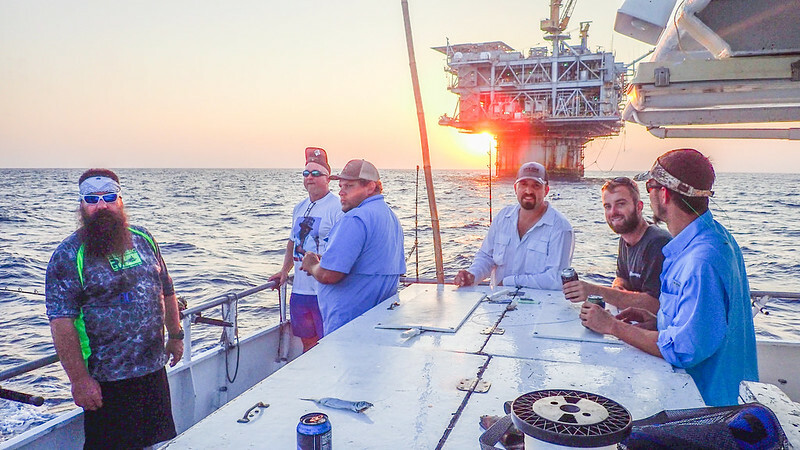 Outbound Port Aransas Harbor - time to bust out an ice cold beer for the jetty bar cross with The Crew! Houston - we don't need no Flight Control! SEE YA GRID! This is all the TECH WE NEED! 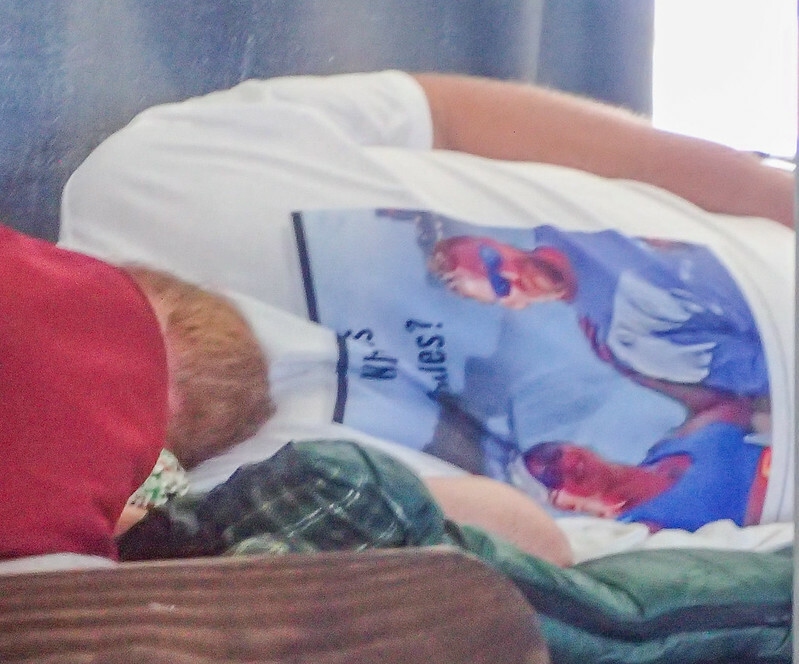 As we sail offshore - some nap.......missing a few of our Crew who couldn't make the trip. Vacation in Niagara Falls I believe? 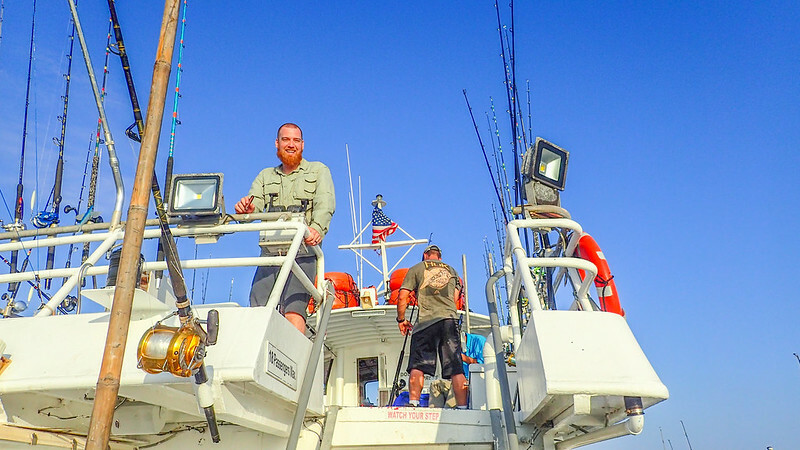 As others rig tackle - as we sail under a beautiful November sky. Burnadell couldn't make the trip with us......but we thought about Randy a lot! Get to Hoover Diana before sundown and proceed to troll. Picked up Cuda, Mahi and Blackfin tuna. Lot of bait in the water column and the currents are in step with the prevailing wind - SE flow. 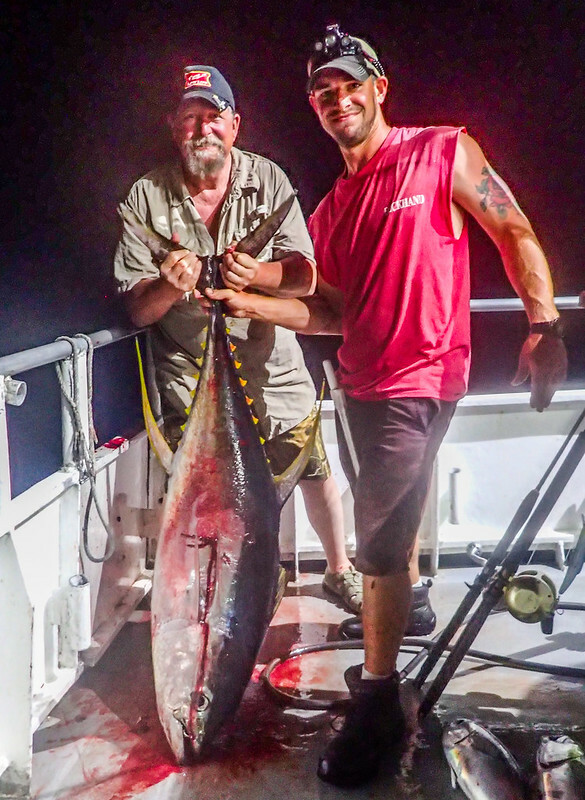 Bisch catches the his first Yellowfin Tuna on the troll. 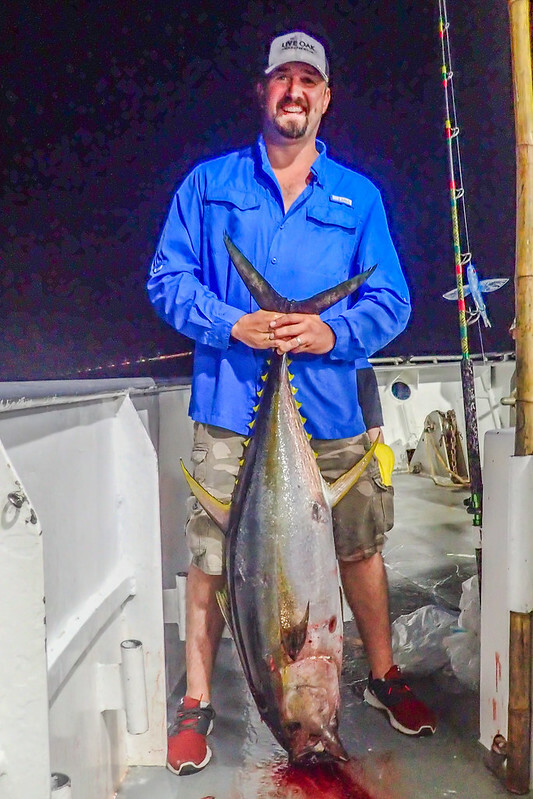 It's also the first Yellowfin tuna for the trip. 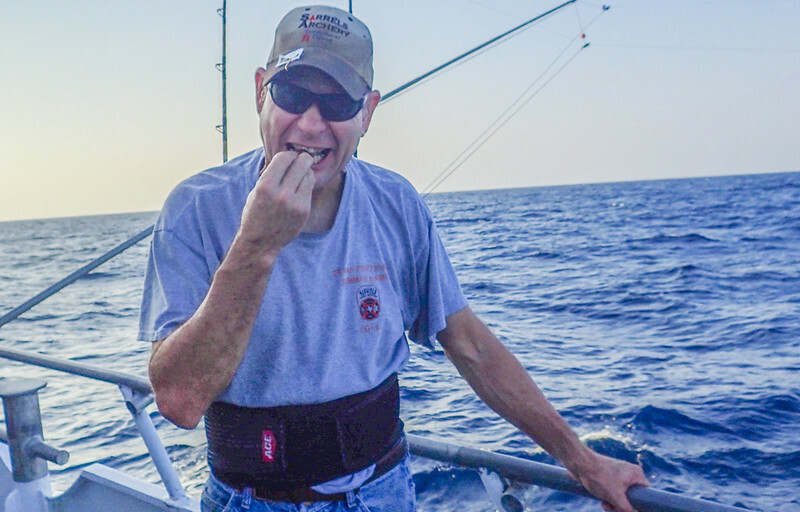 It's customary to eat the first tuna heart from the fish you kill. 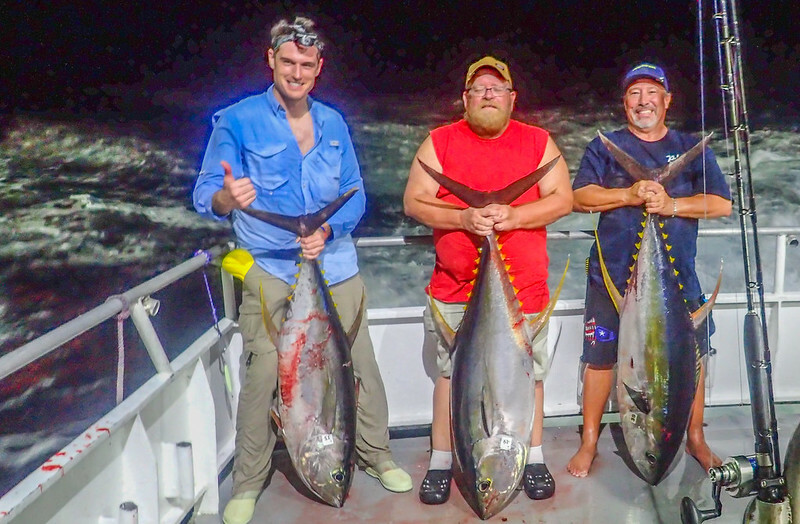 Night one - first tuna's for the three of us for the evening. Last edited by AtTheWall; 11-09-2018 at 03:41 PM. We steamed over to Boomvang, leaving the tuna bite at Hoover. This move will at least show which rig will cover night two's tuna action. And this puts us within a short 2 hour run to the grouper - deep drop area fishing 200 - 900ft of water. 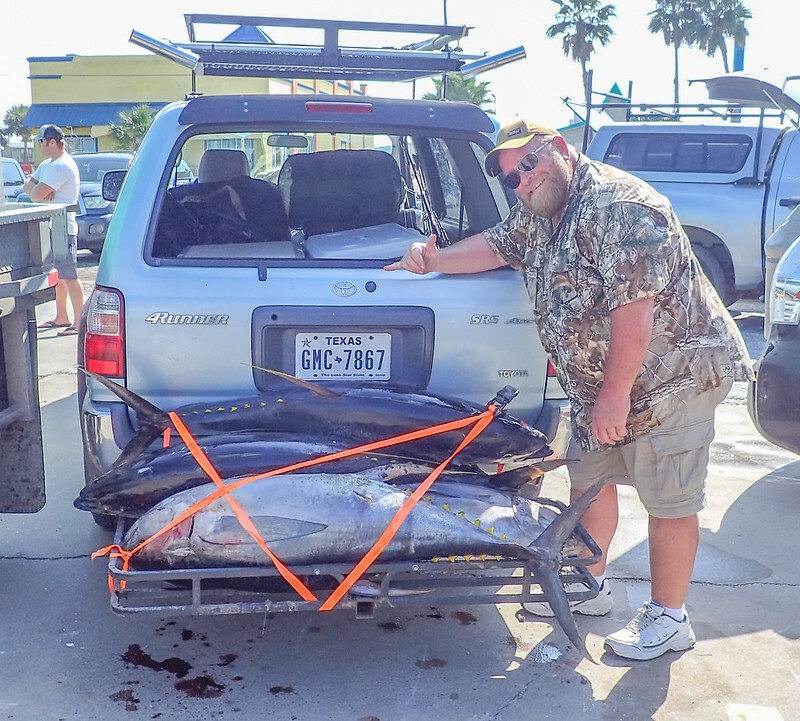 Picked up a couple of tuna at Boomvang - and leave at sunrise for the deep action. 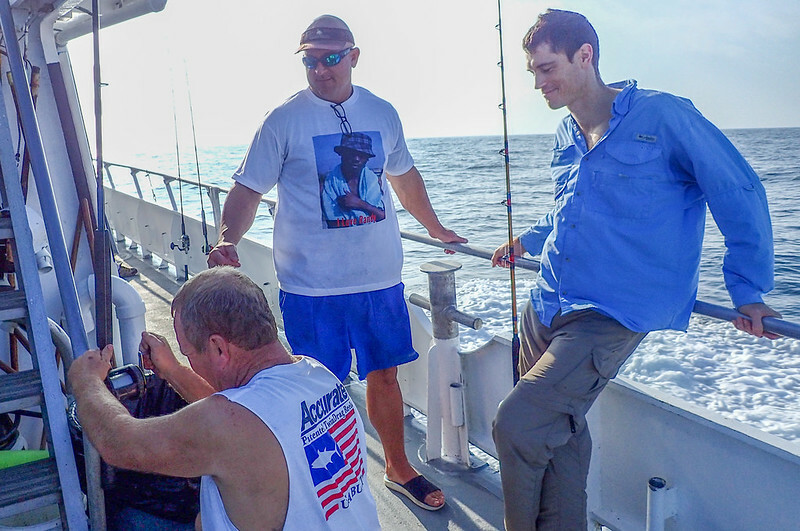 We picked up Almaco Jack, Barrel Fish, Vermillion Snapper and assorted Grouper. 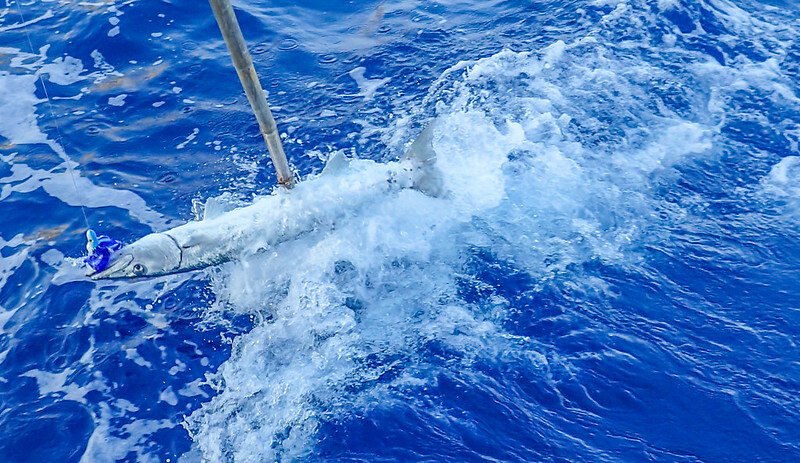 Dusky sharks circled the stern as Mike fished for Makos. 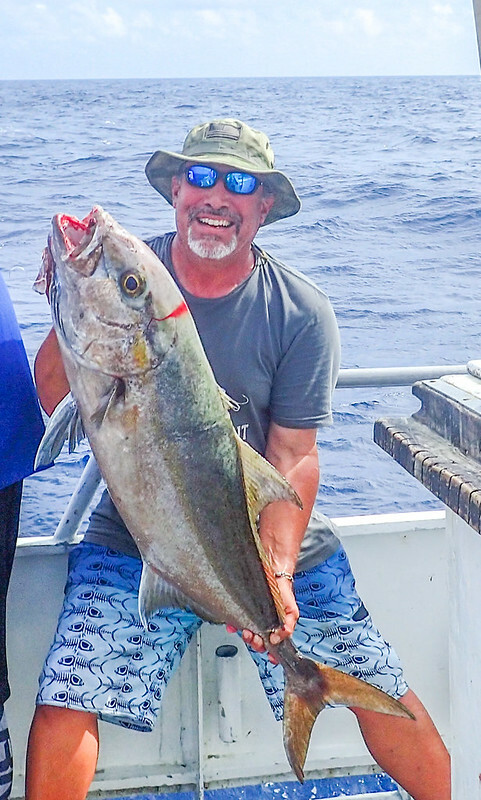 This is Chuck's first Amberjack. Not in season so this dude was released after the photo. 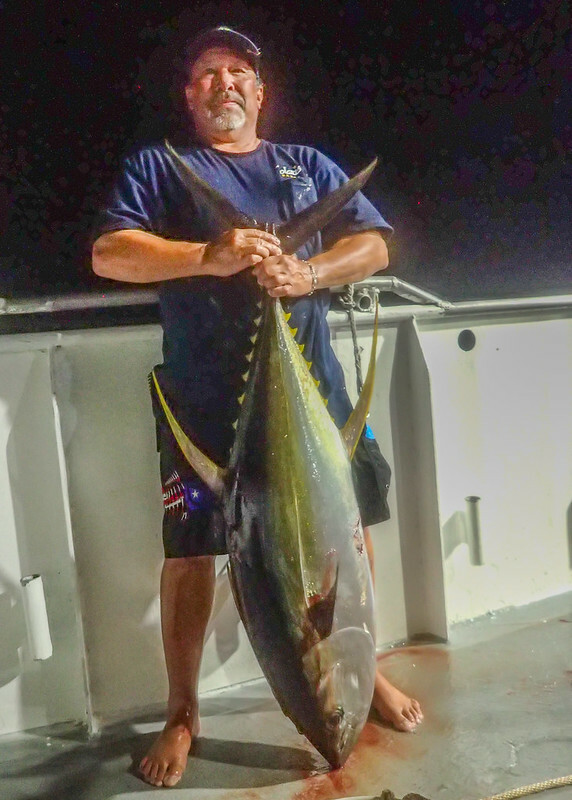 Almaco Jack from 900ft - fishing on the bottom. 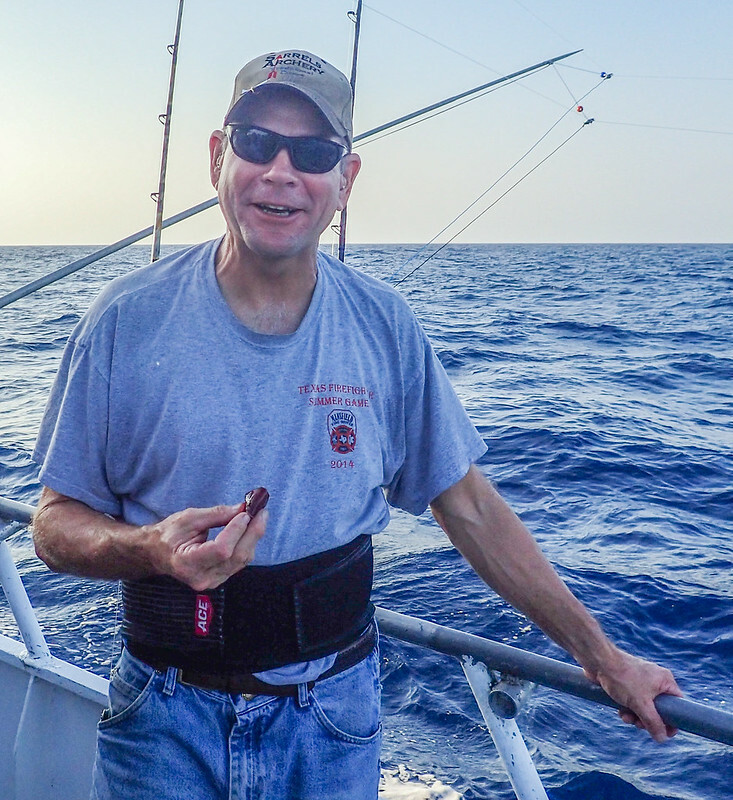 900ft Barrel Fish - wonderful eating fish - flesh is white. 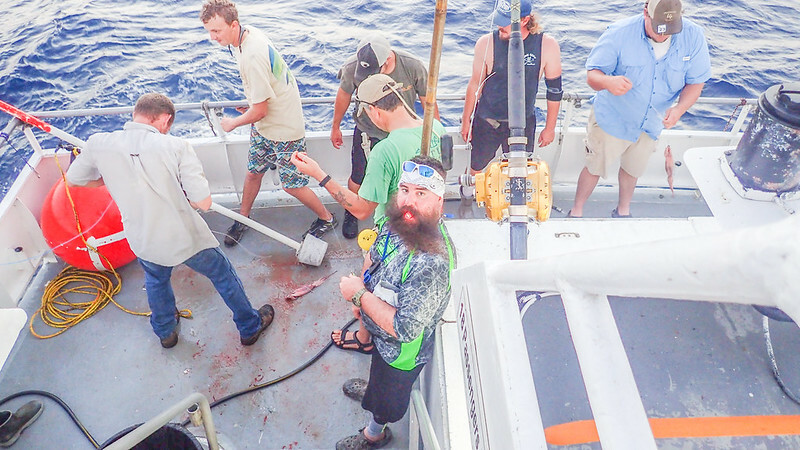 Massive pupils - considering these fish only in the deep regions of the Gulf. Back to Hoover Diana to wrap our trip up around 2 AM before steaming home. 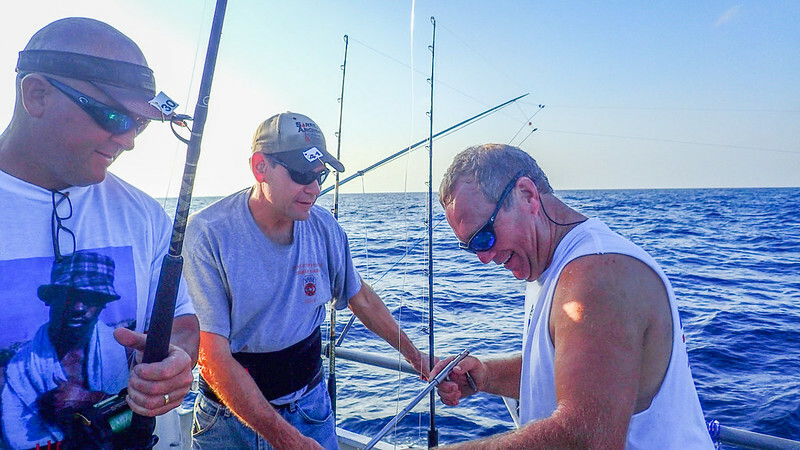 On the first drift we decked 11 Yellowfin tuna. 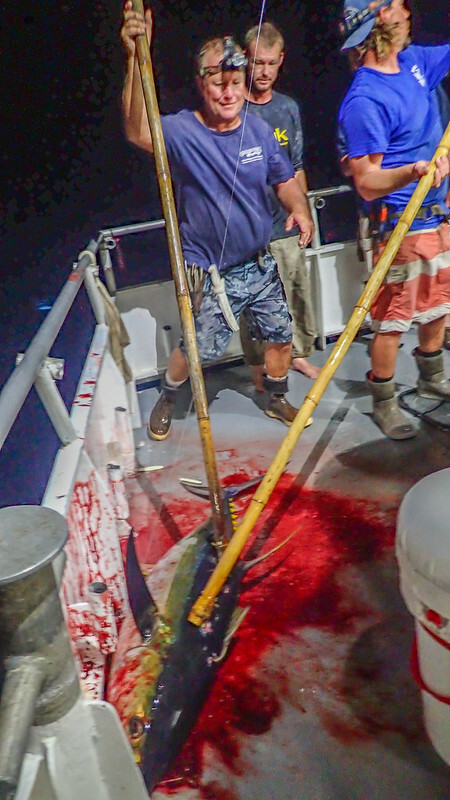 The seas are super calm and tuna are everywhere but tonight is different. 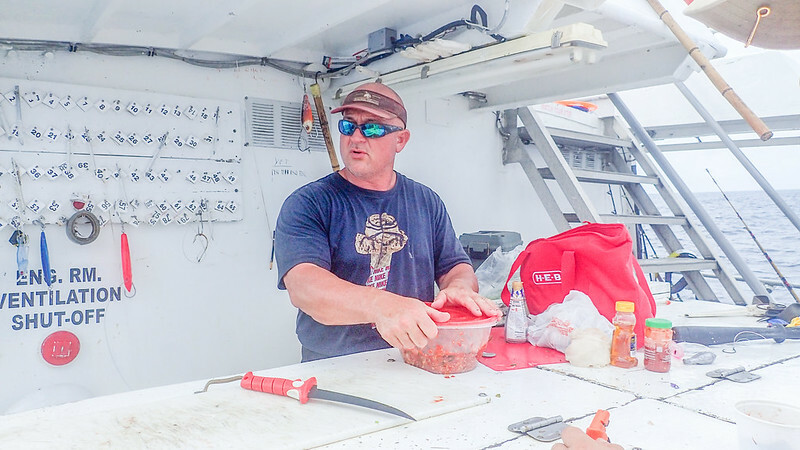 The bite is mixed and tuna are circling the boat, 15ft off the hull, circling in the lights but, they are not taking baits with abandon. We watch dozens clear the Gulf, flying through the air as the night before but, they are very selective on what they are feeding. 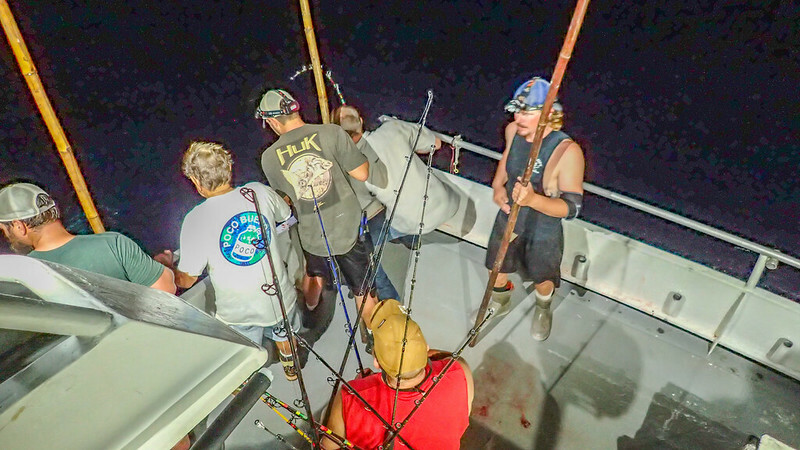 We knocked out a lot of fish but it was more of a mental grind. Seeing them visually in the lights, so close, so massive...selectively feeding. 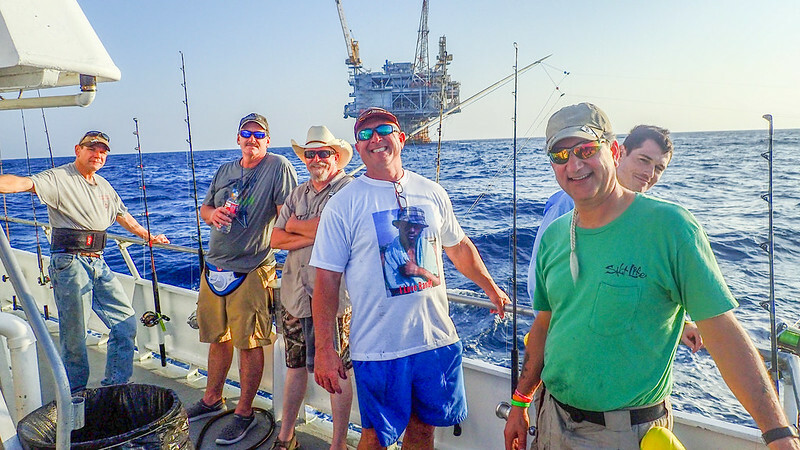 A few of us witnessed a 100lb class tuna chase down a flying fish. Just off the port bow as this flying fish reenters the water, the pursuing yellowfin tuna nails it and it swims by, with this flying fish riding on it's lips, swimming aft at speed. Scenes like this played over and over around the boat. Many opt to run chunk baited lines in the lee as the Dolphin Express drifts slowly off the Hoover Diana. 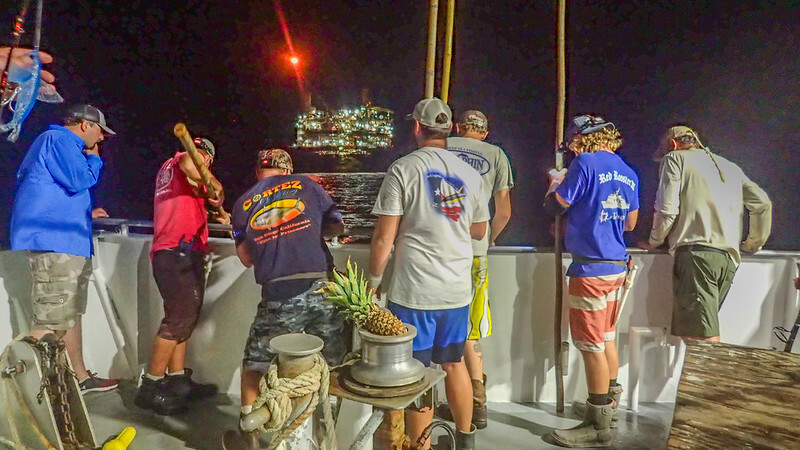 Everyone aboard is sore, tired and the pace has changed into more of a wait on watch as the tuna show goes on into the night. 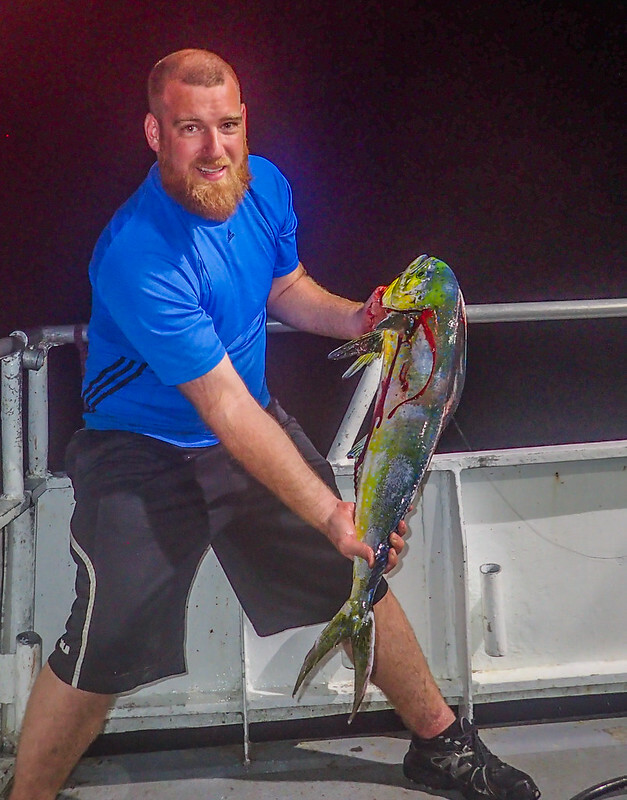 I scored my 4th and final Yellowfin this night. Over the course of the two nights, I hooked 10 fish solidly and lose 6 of them. 3 lost on the first night with 3 more lost on the second night. Dozens of blow-ups by tuna that miss my topwater altogether. 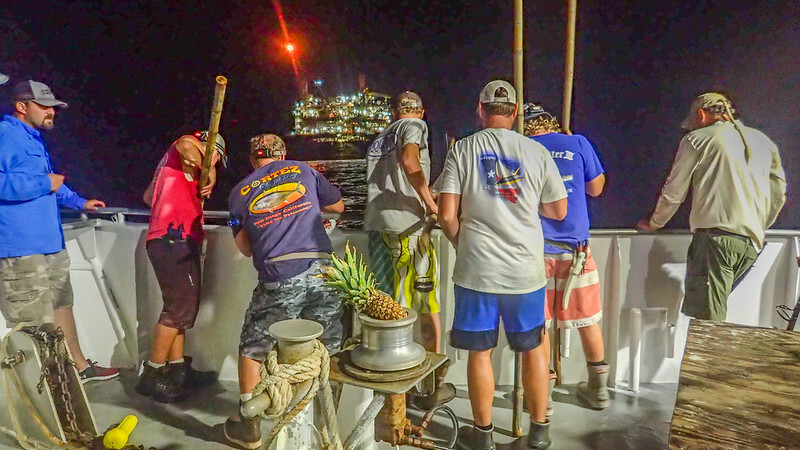 There are times I'm on the bow casting alone and other times, I'm standing elbow to elbow with The Crew (Us and Dolphin Express) folks. 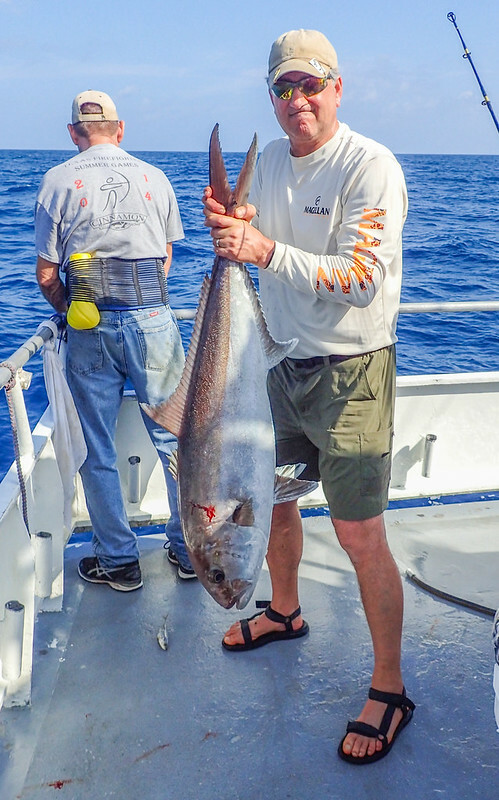 With fish in this size category, the loss rate can run a bit higher than chasing smaller class tuna. It's just the name of the game at times. 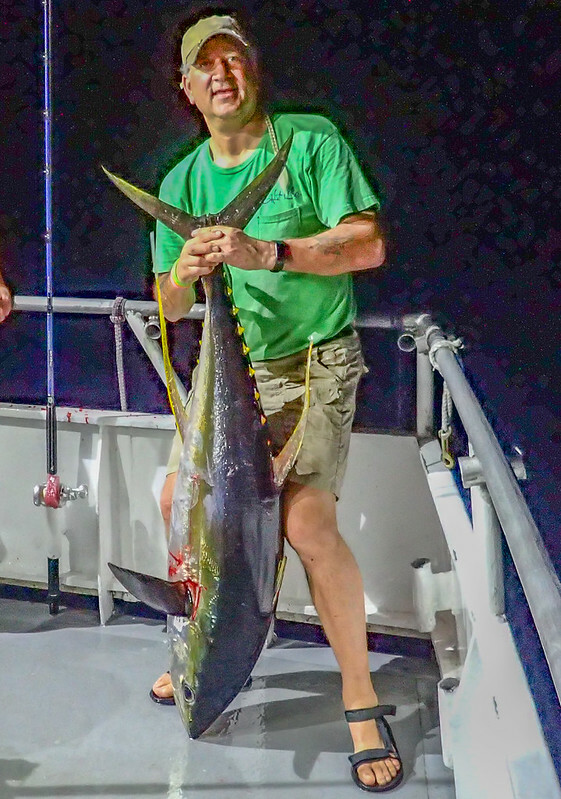 I hooked my largest Yellowfin tuna to date only to lose it after a solid 30 minute battle. Fish hit and proceeded to unwind 3/4 of my my spool straight down. I managed to work this fish up 120FT down or so. I'm fishing a 40 yard wind on leader and it's holding where my braid and leader meet on the blank. It's circling and I'm trying to get lift, gaining a few feet only to have it take the line back. Over and over we go. 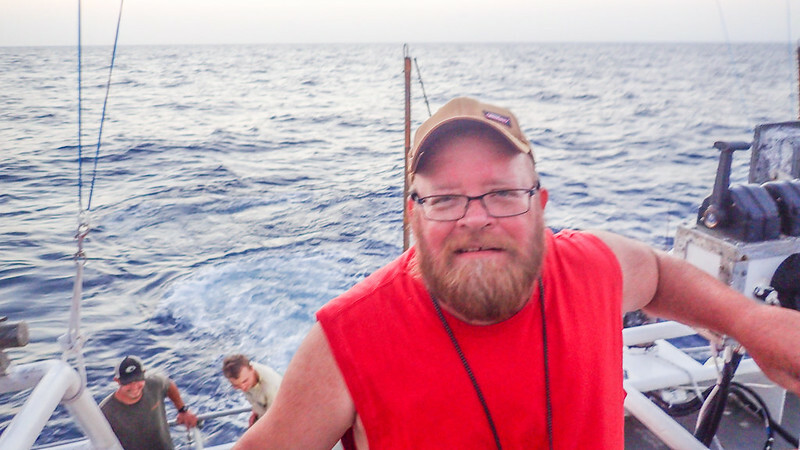 Another tuna is hooked on the opposite side of the bow and decides to come around the pulpit to my side. It crosses my line - stretched tight vertically. 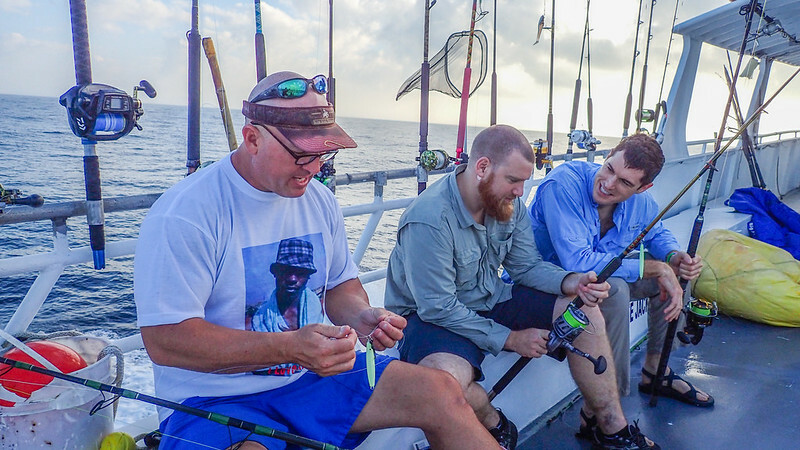 Timmy releases the drag on the interfering tuna and we get our lines uncross but moments after we free ourselves - my line parts. 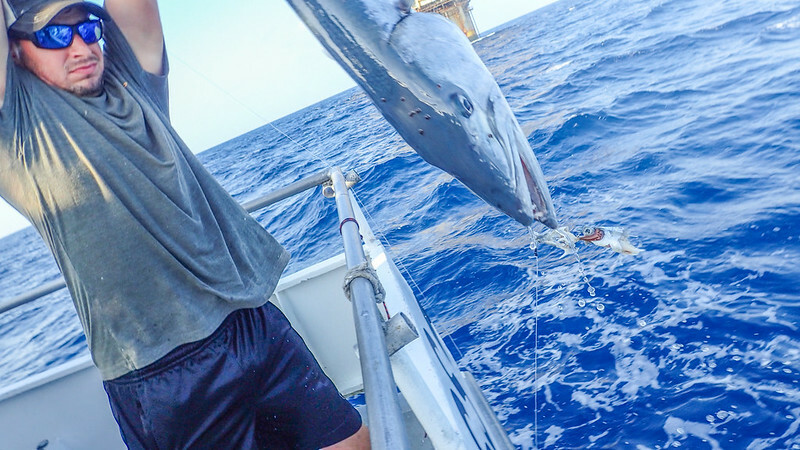 Not sure if it was our momentarily wrap and or a barracuda, chasing my Frenzy flying fish riding up and down above the tuna and hook, as I battle this fish? Glen prepares his trademark Tuna Poke. Night two. I couldn't cover it all this trip, pixels, without putting my rod down and completely stop fishing. I’m allready getting ready for next adventure. It was epic. Laughed, joked, and watched new guys kinda laugh at me on way out when I asked if they ever took a buttwhoopin from a fish. 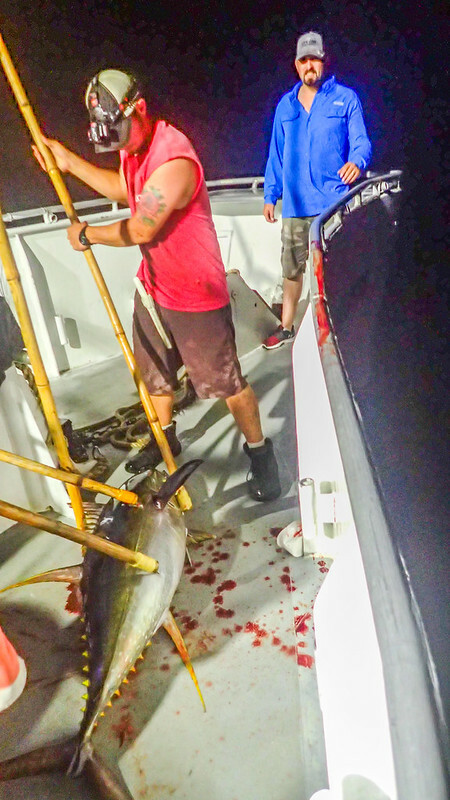 Later in the trip at least 2 or 3 guys came back up saying how they underestimated the strength of a tuna. It was an awesome trip! And yes Glen, those fish are stroooooooooong!!!!! Y’all must be living right. Nailed the weather. 24 hours later and it’s 10ft. Congrats on the tuna. Good thing Bisch didn't take his Bow. Now at least there is still a chance he left some fish for everyone else. How about some bloody decks! After two nights of tuna.....Mike went Wino with exhaustion. 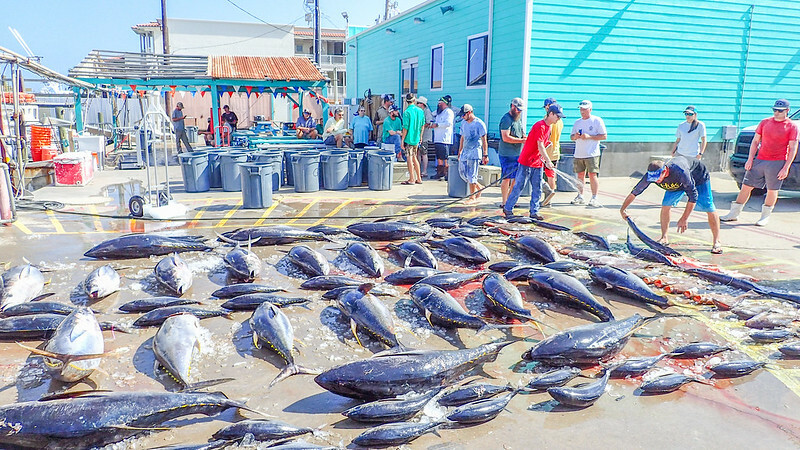 The tuna average weight wise, pushed 80 or more. 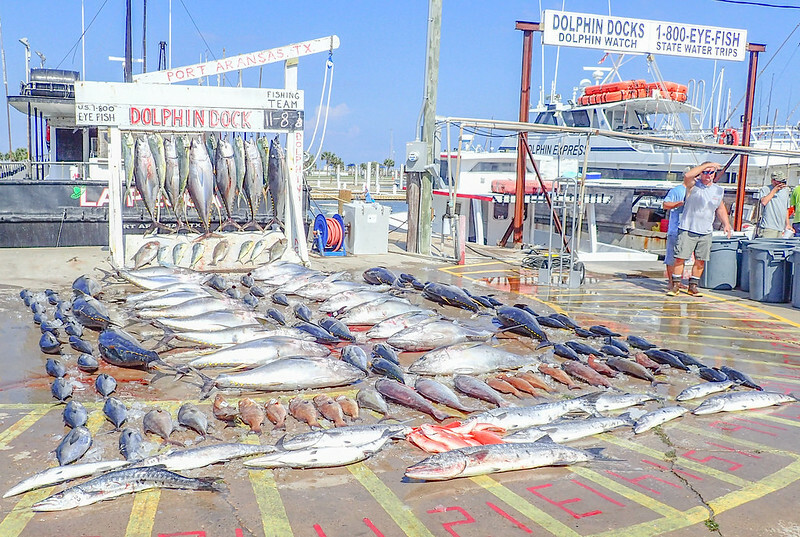 We decked a lot of quality fish.....many went over 100 lbs. When you contemplate the time we actually fish, in comparison to the transit time. 10 out, 10 back, 2 hours here, 2 hours there and another 2 hours back. 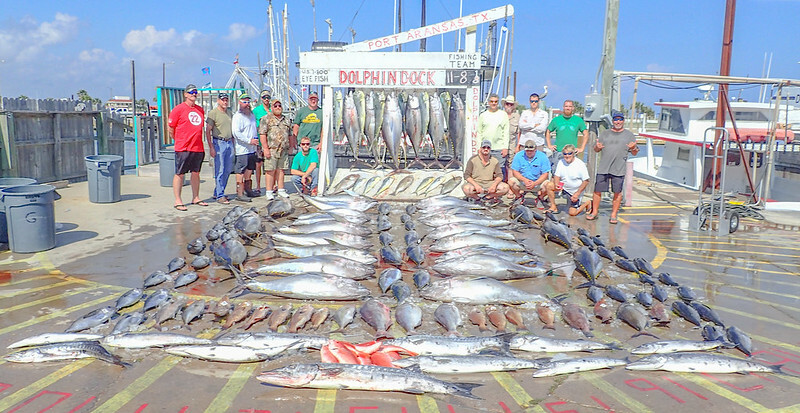 This pile represents 26 hours of fishing. 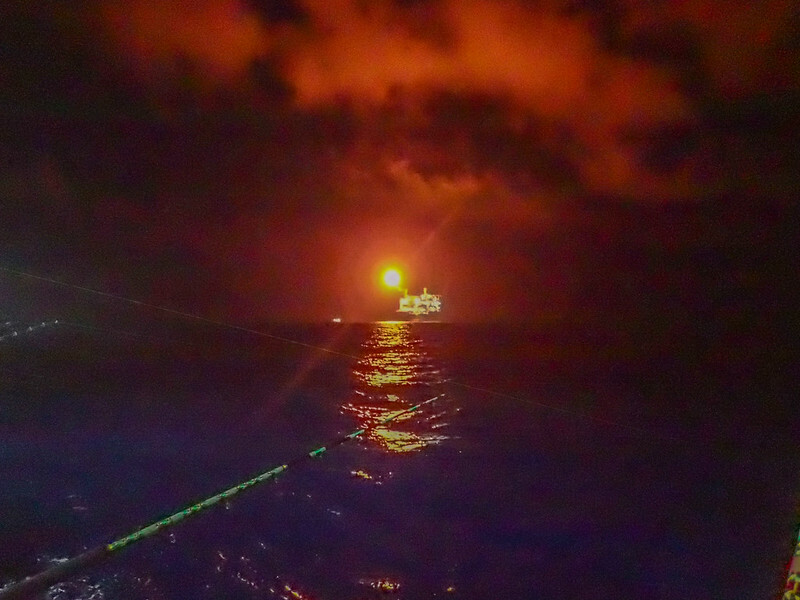 2 floaters, an oil platform and 4 anchorage stops. All of this requires time to get there, setup and reset on a new location. This was the number one thing that jumped out at the San Diego - Mexican Baja longrange boats on the left coast. We hammer tons of fish in a very little fishing window. 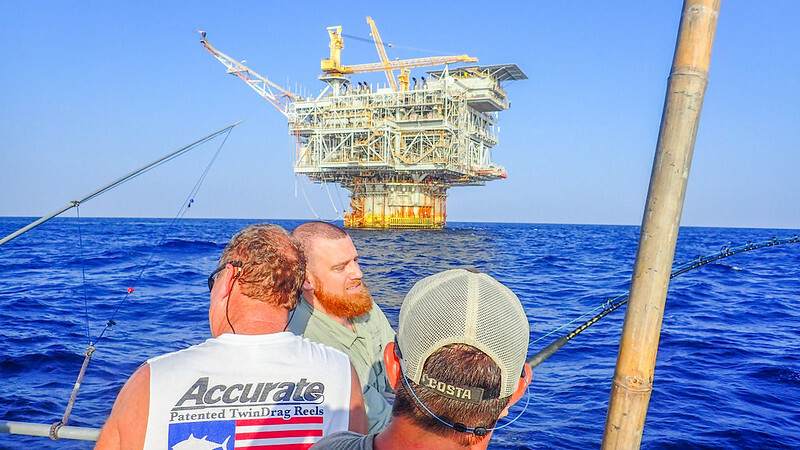 Gulf of Mexico along the Texas coast - no mistaking it, with the right boat, Captain, gear and anglers - you can flat out fish any other place on the planet in the same time window. This is something many do not know. 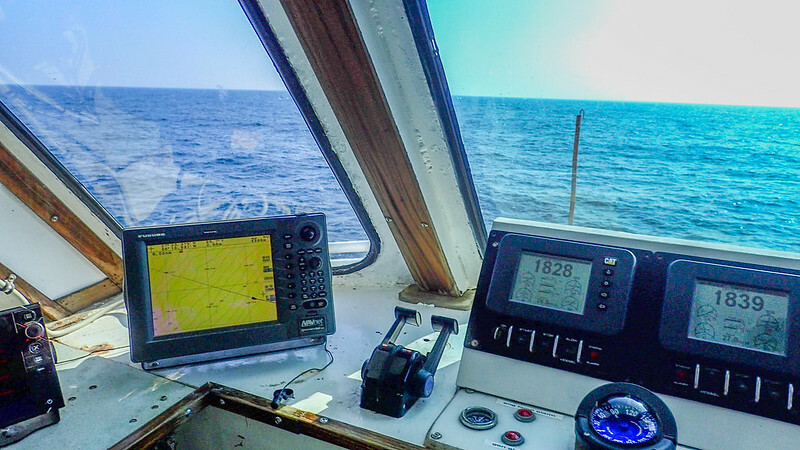 Those of us who spend a lot of time offshore understand, we are truly living in an offshore paradise. 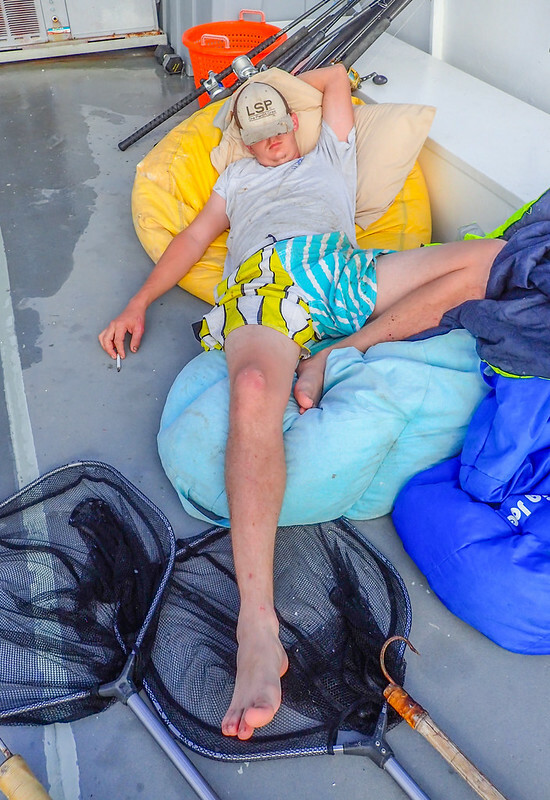 I’ve seen these multi day tuna trips coming in when I’m standing on the dock ready to crash after a 10 hour trip. Couldn’t imagine the whippin you take on this long of a trip. Looks like an awesome time...someday! Man, I have to totally disagree. 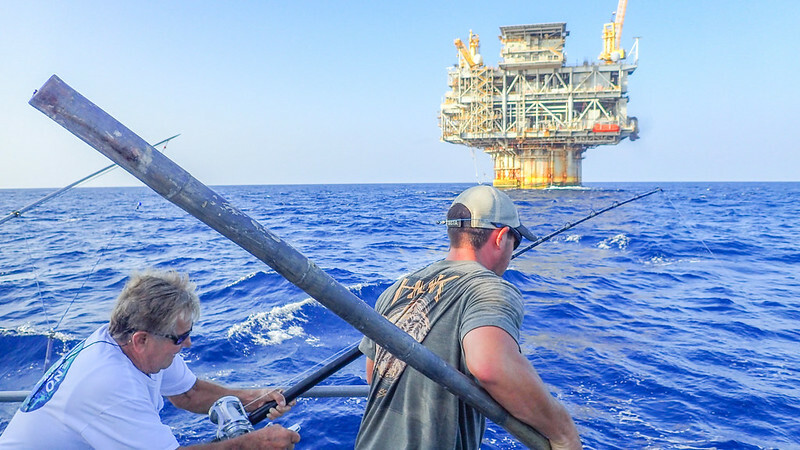 We live in one of the worst offshore fishing destinations I can think of. 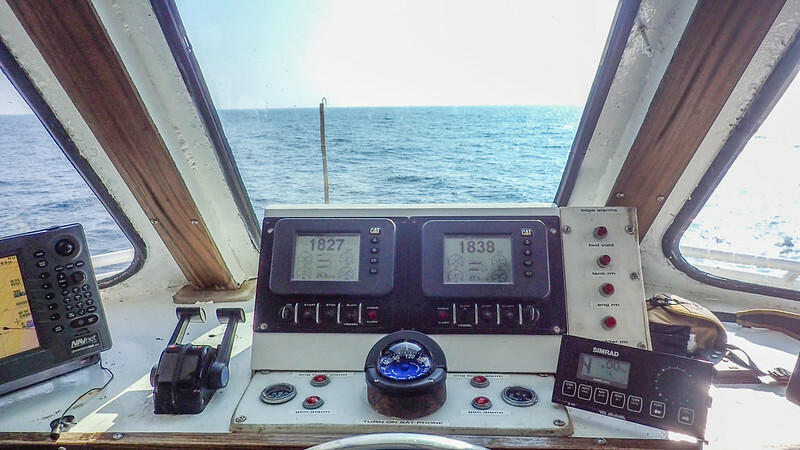 100nm runs, snotty seas, and mediocre fishing. 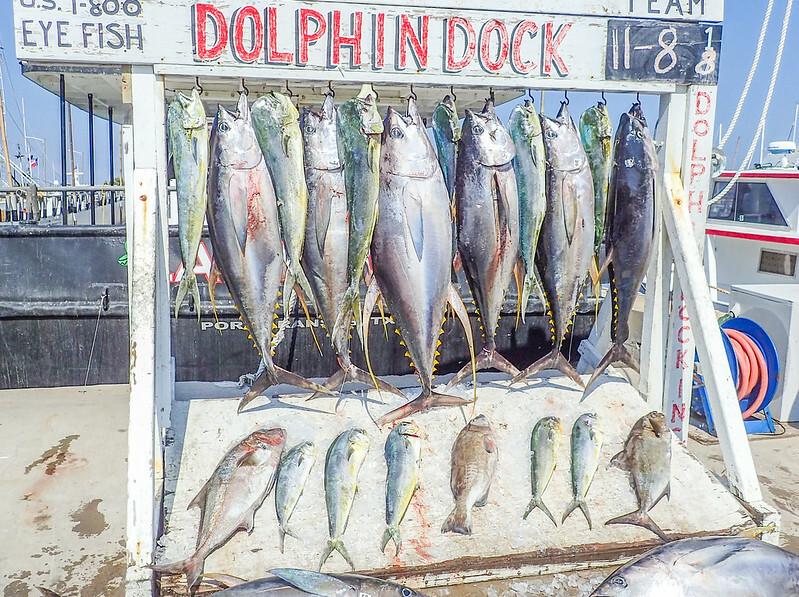 Tuna fishery is very hit or miss and the billfishing is extremely mediocre. The only world class fishery we have is winter time wahoo, if the weather let’s you out. If I didn’t love my boat and doing my thing, I would just fly to Costa Rica, Guatemala, Cabo, Venice, DR, Bermuda, I can name a pile of places. I have fished all of them....never came back with 3 tons of fish at anyone of them. Even in Alaska......never nailed that many in a short window on a boat, lining the rail old school and drifting to deliver. Trolling - maybe. But drifting and casting to a top water tuna bite. Haven't found it to match. Texas tuna - this is what I'm comparing these other places to. A bite that happens with CASTING GEAR ON TOP! Little reels, little lures and big tuna that smother a well casted topwater bait. Running a troll spread - sure, you can grind up fish but, that fishing wait till the strike. This fishing is - no strike unless you make it happen - working your setup, over and over till you connect. 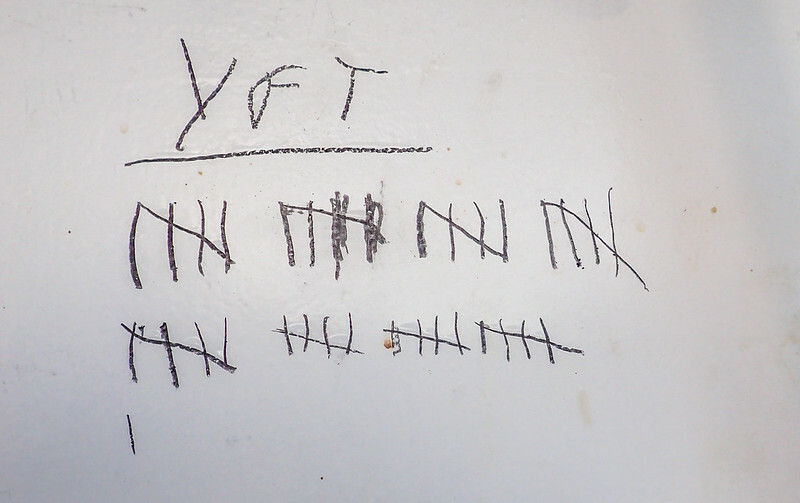 It's not iffy for us.....we catch well over a ton everytime we setup a trip. The key, you must factor in the period, weather and moon phase during that golden time of the year. It's not year round.....like the whitetail rut, you hammer them during their prime time. We have that dialed in! And during that period - hundreds surround you as you make the cast......watching blow up after blow up. My average catch to blow up ratio is 6 to 1. I get 6 missed blowups to a single hook-up. And the cast ratio to get these 7 chances is probably 100 - 200 casts to have that opportunity. It's not everyone's cup of tea....body screams, muscles burn and you haven't even hooked that first tuna. Not many anglers can burn to score......even bass casters who do this religiously week in and week out. This gear isn't finesse yet, we muscle through the presentation, over and over before the score. 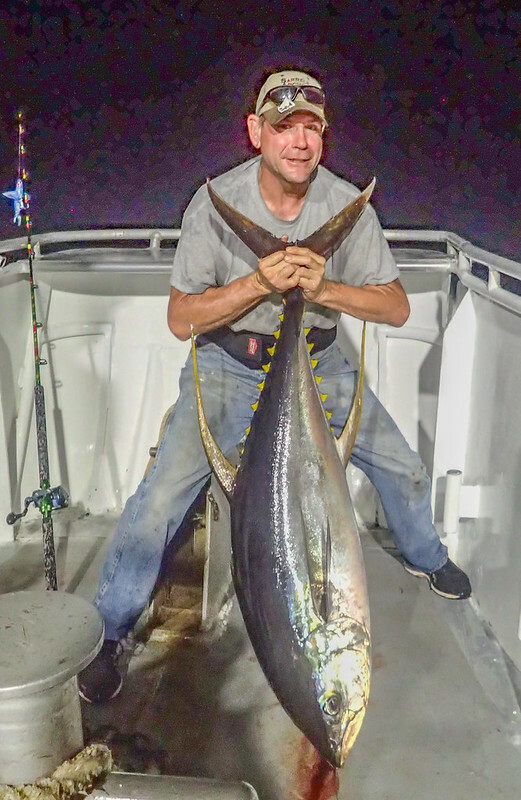 Had a very salty Dude from Southern California tell me - it takes a lot of skill to cast the gear we use with the baits we cast, to score tuna. Line class alone with a light bait, it's not an easy thing to do with a 2-Speed reel. This is the other factor - it's not something you can simply go do and score. It takes considerable skill to do it this way. 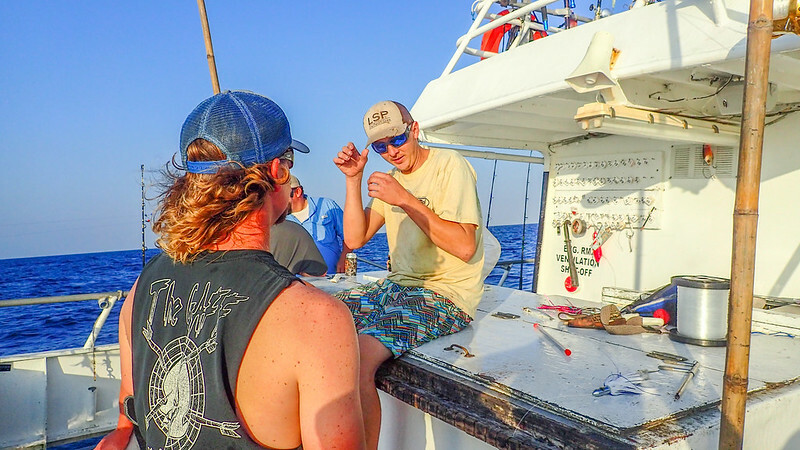 Hook-up, it's all standup and running a 95 - 100ft deck with a tuna that can swim 40 mph. 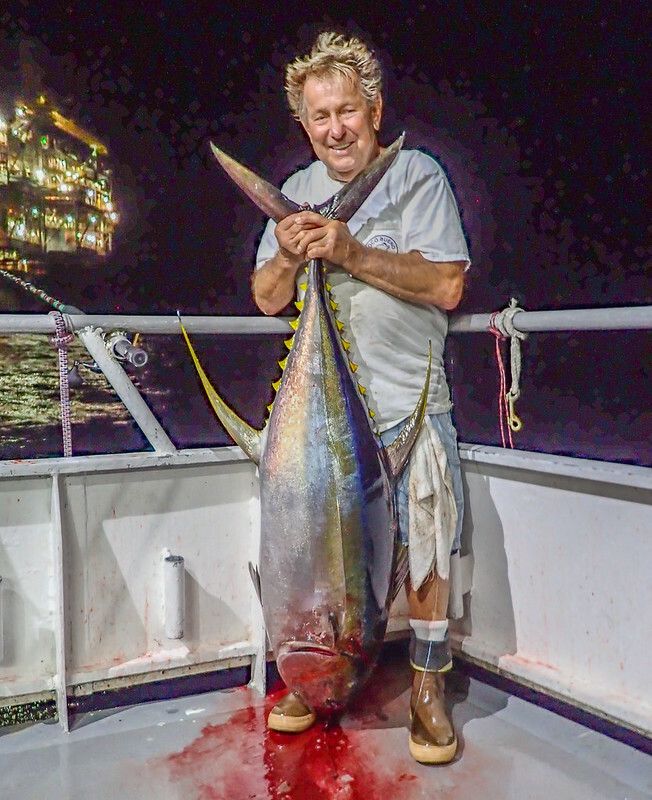 Rounding the pulpit and transitioning from port to starboard and or vice versa, with a mad yellowfin tuna, adds another factor into this game. 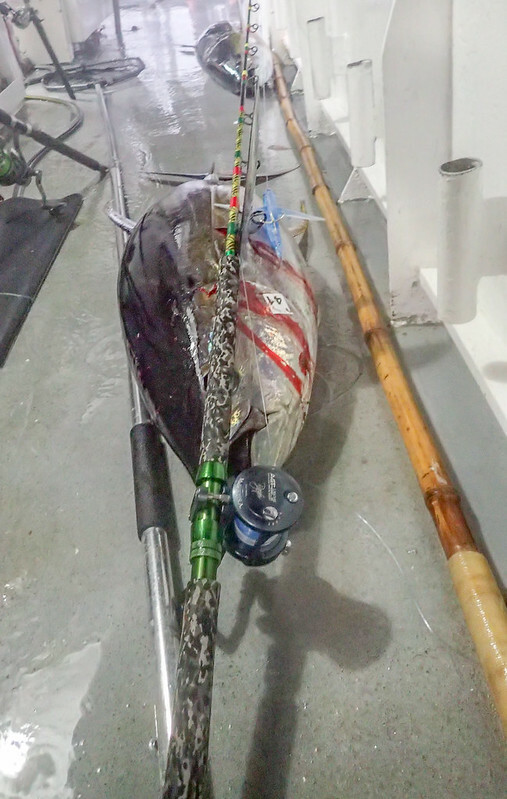 Only a couple of places in the world have Combat Tuna fishing.....we have it here in SPADS! Last edited by AtTheWall; 11-09-2018 at 11:49 PM. This is that scene. The battle on the focescle - in the pit with a bruiser. One of hundreds that have jumped and circled the boat on a feeding frenzy. You visually witness a world that becomes unique in many regions of the world's oceans. 2% moon illumination at best, during that period where the tuna are there off the Texas coastline. Your limitation is fuel load and range. This is where we have no worry. Louisiana to the Mexican border, if we really wanted to, we can do it - all along the shelf and deeper rigs. What we have here are options directly due to the offshore oil industry. All of them hold fish. 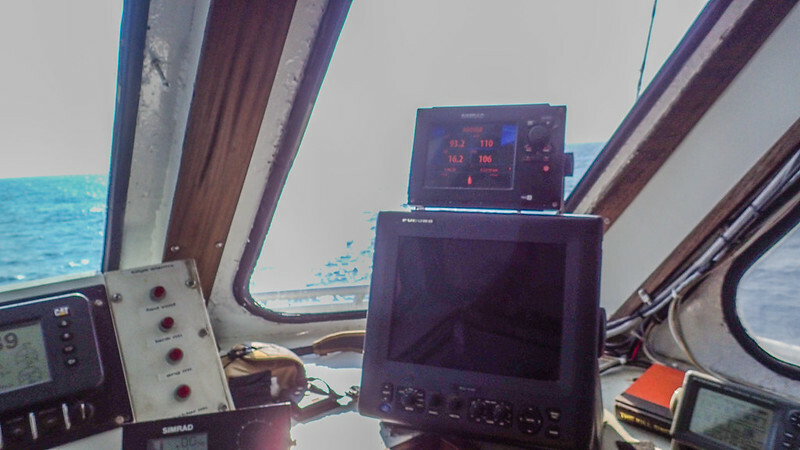 Getting there and playing that game, requires the vessel to do it with range. Not a Mosquito boat venture. We are talking true 100 ton plus platforms. 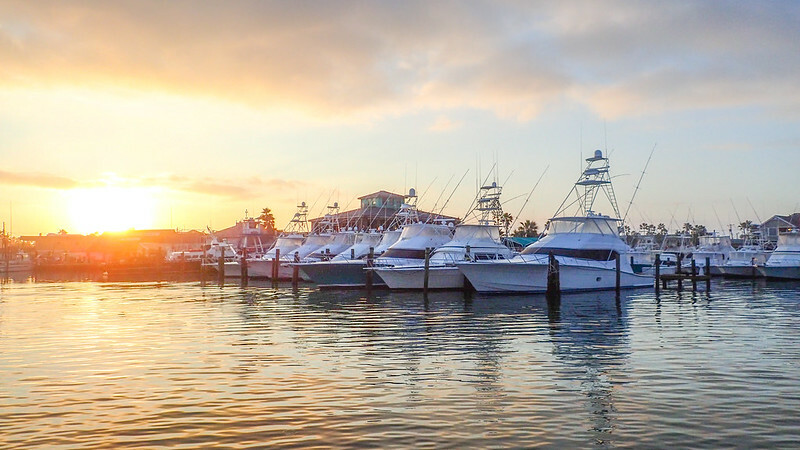 Give me October to February along the Texas Gulf of Mexico on the right boat. Go top down to 1600ft, they are there. 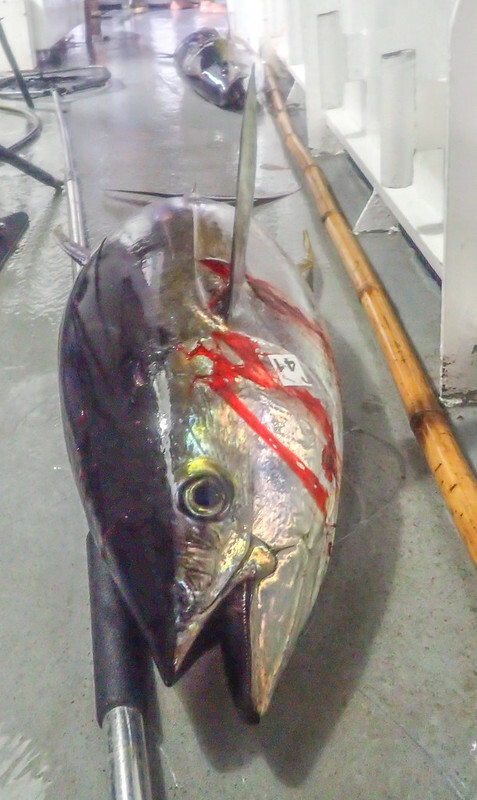 Bigeye, Yellowfin and Swordfish - they are there. Just need the platform to run that 100 miles into the zone with the onscene duration, to stay in that zone. San Diego long range - 5 - 17 days to do a fish. 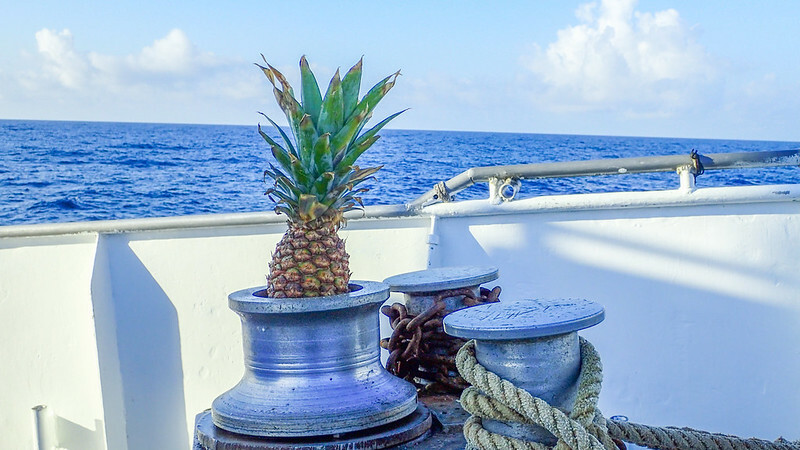 The tropical islands and mid latitudes from Caribbean, Central America which includes Asia.....they all need offshore livable duration with the right fuel load. Costa Rica - close but, the fleet, one day maybe day and a half and you must come back inside for fuel. Sustainability is not there and the fleet to extend multiple days, it's not there either. 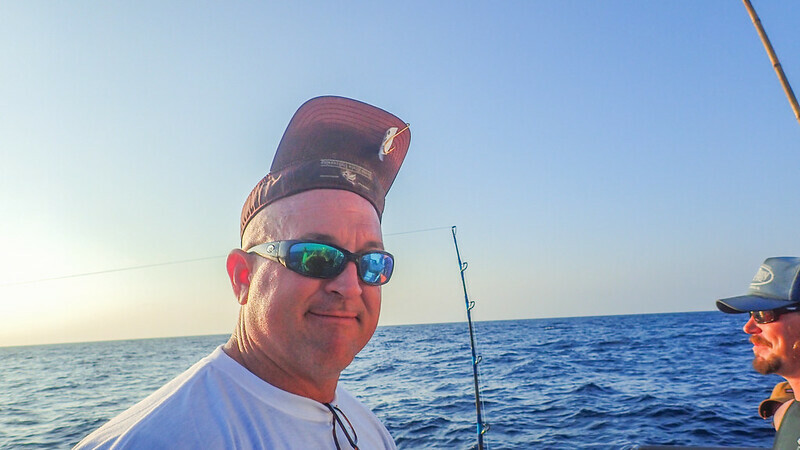 Multiple days offshore before return - it's that world......where running miles between offshore opportunities are an excellent excuse to drag baits. 4,000 plus gallons of Marine diesel country type platforms. Once you make that the benchmark, the opportunities to play days offshore narrows down considerably. Last edited by AtTheWall; 11-10-2018 at 12:18 AM.